The Sao Tome Weaver was formally described by Karel Johan Gustav Hartlaub, a German physician and ornithologist. Carl Weiss, a German collector, was the first person to obtain specimens of the Sao Tome Weaver for The Hamburg Museum. He travelled from 1847-1850 on the ship Adolphus to Sao Tome then to the coast of Ghana, to Principe and back to Sao Tome again. 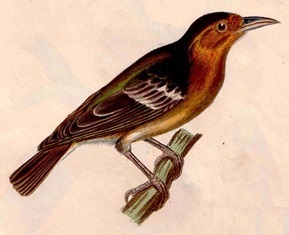 He probably collected the Sao Tome Weaver soon after arriving on the island, and sent back many bird specimens which Hartlaub was able to describe in 1848 and later. 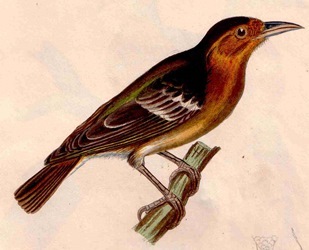 The first illustration of a Sao Tome Weaver is a colour painting published by Hartlaub in 1850. The second illustration was published by Reichenbach 1863. 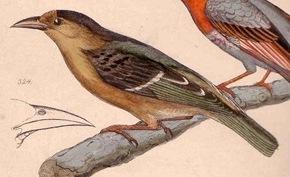 Sycobius st.-thomae	Hartlaub 1848	Rev. Zool. 1848 p.109	Sao Tome. sanctithomae - Named after the island of Sao Thome (Sao Tome) in the Gulf of Guinea, West Africa, discovered by Portuguese explorers in 1471 and named for St Thomas, the patron saint of Portugal. The St. Thomas Coucou-Weawer (Reichenbach 1863). The type specimen is in the Zoological Museum at the University of Hamburg. Identification. The Sao Tome Weaver Ploceus sanctithomae is a distinctive short-tailed weaver, easily separated from other weavers on Sao Tome. 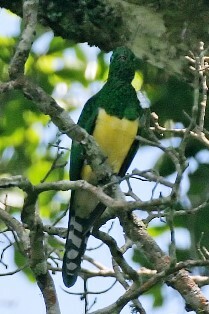 It has a black cap, orange-buff underparts, and dark brown upperparts with 2 conspicuous pale wing-bars. The female is similar to the male but duller. The juvenile is duller still, with the underparts mainly white. These weavers are noisy, making it easy to find. This is one of the 'nuthatch' (bark-gleaning) weavers. Distribution. 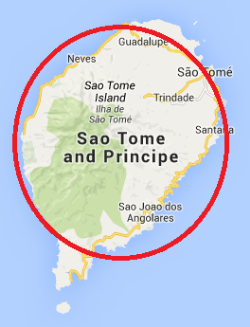 The Sao Tome Weaver is restricted to Sao Tome Island in the Gulf of Guinea, where it is common and locally abundant in forests in the south-west and central east parts of the island (see Google map below). Habitat. The Sao Tome Weaver inhabits primary and secondary woodland but not the grassy wooded savannas in the north. It lives in pairs and family parties, during and after the breeding season, and forms flocks of at least 20 birds outside the breeding season. 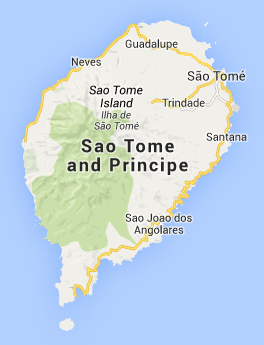 Sao Tome Weavers are noisy, singing and often calling. Food. Its diet is seeds, and also insects (including ants and caterpillars), spiders, and the nectar of Erythrina trees. It forages at all vegetation levels, particularly where mosses and lichens abound, and often near the bases of tree trunks. It climbs vertically up (or sometimes down) mossy tree trunks, inspecting moss, lichen, and holes in bark and rotting branches. It probes vigorously with its bill, lifting up bits of moss. It also hunts for invertebrates amongst leaves, and probes into curled-up dead leaves. Breeding. The Sao Tome Weaver is monogamous, but two or three pairs may nest in the same tree. The nest is retort-shaped with an entrance tunnel up to 100 mm long, constructed mainly by the male. The nest is suspended from the tips of branches at 5-15 m (mainly 6-7 m) above the ground. The leaves are stripped from the twigs with nests. The nest resembles that of the Dark-backed Weaver or some Malimbes. The nest is made of liana tendrils, resulting in a rough surface and the nests are never green. Nests are lined with lichen, moss and leaf skeletons. One nest had an additional entrance and more observations are needed to see if this is a regular occurrence.